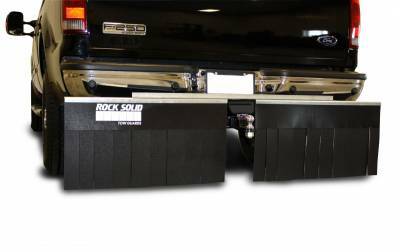 The Rock Solid Mud Flap System is attaches to the rear bumper protecting your coach, tow vehicle, and passing cars from dings, dents and paint damage. Flying rocks, gravel and road debris shoot from the rear tires every time you drive. 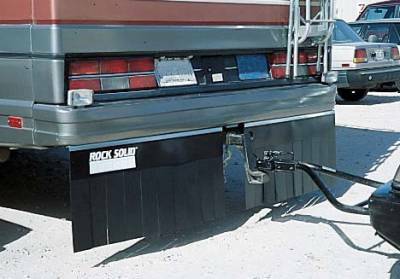 You can prevent chips and dents in the front of your boat and trailer with the Rock Solid mud flap system. This system is made from durable lightweight materials. The design reduces wind drag and helps fuel economy. Individual strips can be adjusted to accommodate exhaust mufflers, hitches, electrical wiring, etc. The Rock Solid kit comes complete with two sections and all mounting hardware. Whether you are a driving a Coach, or towing your 5th wheel or boat, Rock Solid Mud Guards by Smart Solutions has the tow protection that´s perfect for you. Made from durable, all-weather resistant thermoplastic rubber. The two-piece design is fabricated in flexible strips of material attached to a steel angled channel. The motor home model attaches permanently to the coach while the trucks and SUV model mounts to a two inch receiver hitch and is easily removed when unneeded.